I have a confession to make. I'm a mummy-blog whore. I love reading blogs by mums, especially the humorous ones. Please don’t ask me why this is my preferred blog genre. I swear I've TRIED to prefer beauty and fashion blogs but they bore me. I've trawled cooking blogs and all they did was make me hungry. I’d call myself a wannabe mummy blogger except I'm not really at the stage of my life where I have a burning desire to push out kids. That said, I would like them one day. Despite this, I often feel the need to write posts about motherhood even though, well, I don’t have anything to say. So today I took a glimpse into the future and decided 5 things I will never, ever do when I have children. 1 - Not use drugs (when giving birth, obviously). If I have to push something that big out of a place that small I am getting all the drugs they have. I might even bring some of my own from home just to be safe. 2 - Put a BABY ON BOARD sticker on my car. Everyone else in the world judges people who have a BABY ON BOARD sticker on their car. I know this is true because I judge people with BABY ON BOARD stickers on their car – and don’t even bother spouting to me some crap about how it’s a ‘safety precaution’ and if you’re in a crash the paramedics will know to look for the baby and blablabla. No. Just no. I think the car seat and the screaming baby will probably give that away. I don’t drive any more carefully around cars that have these stickers on them so that’s not an excuse either. If you have one, take it off your car and punch yourself in the face right now. 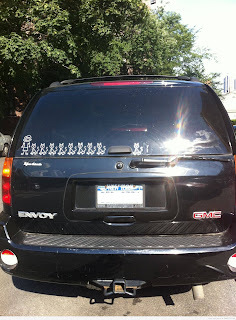 3 - Put ‘My Family’ Stickers on my car. 4 - Name my kid a perfectly normal name and give it a ridiculous, made-up spelling. This was further cemented today when I was at work and met a Jakeob. As someone with a relatively uncommon spelling (in Australia) for a pretty ‘normal’ name (my birth name is Jaclyn) I already face enough issues with the spelling and pronunciation. If I can’t even get through a day without someone calling me Jocelyn, how is poor Jaeysin (Jason) supposed to get through life? My car sing-alongs included Queen, James Taylor and The Motels and I turned out just fine. I knew all the words to Bohemian Rhapsody before I was 5. There is no way in hell I will put up with tantrums, vomiting and sleepless nights and THEN pile The Wiggles on repeat on top of that – be kind to yourself mummy’s – smash the kiddy CDs and listen to what YOU like. Your kids will thank you for it when they’re older.